Milan is very controversial and has many faces, and because of this there are so many contradictory reviews and articles dedicated to the city. Some people are ready to praise Milan for hours describing the beauty of its architectural ensembles and unbelievable quality of shopping, whereas other Milan’s visitors leave negative reviews explaining it by a small quantity of really amazing attractions in the city and exorbitant prices in fashion boutiques. You should know what to expect from Milan to decide whether it is the exact city you want to spend your holiday in. This article will help you to find out the distinctive features of vacation in Milan and its pros and cons. Being founded approximately 2500 years ago, Milan has a complicated history. Many times, the city was sieged and invaded by enemies, twice it was almost completely razed to the ground. First, Milan was destroyed in 1162 by Frederick Barbarossa, than it was severely damaged during World War II. But each time residences managed to restore their city, and because of this Milan has so diverse architecture. On some streets, you’ll see building made in Gothic style, whereas other constructions will amaze you with its splendor of Baroque or severity of Classicism. 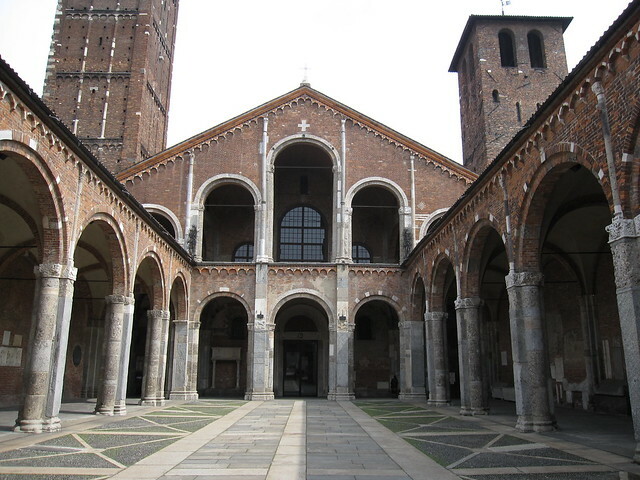 Probably the oldest building in Milan is Basilica of Sant’ Ambrogio dating back to 379. According to a legend, the Basilica was built by Saint Ambrosius himself on the burial place of the early Christian martyrs (in the Roman period, Christians were persecuted). In those times, the Basilica was just a small church. The building you see today was constructed in 1099 and survived several reconstructions in 1144, 1889 and the last one in 1943 after Anglo-American bombing. An interesting legend is associated with the ancient column located on the left of the Basilica’s facade. People say that Saint Ambrosius, when building the church, expelled Devil living nearby. Ambrosius banged Devil on the column, so nowadays you can notice there two holes from the Devil’s horns. You should put your fingers in the holes and all evil will be removed from your soul. 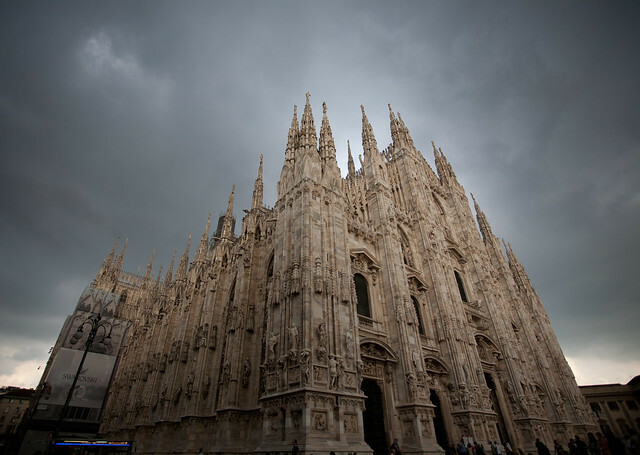 Another significant and most recognizable historic attraction in Milan is the famous Duomo. It’s a magnificent, gorgeous, fantastic, grandiose Cathedral made of white marble in the Flamboyant Gothic style. It’s worth visiting Milan only to see the majesty of the Doumo yourself. It size amazes, it can fit up to 40 thousand people at once (approximately such number of residents was in Milan in 1386, when construction of the Duomo started). All comers can visit the Duomo’s roof and enjoy truly spectacular views of the city from the height of about 100 meters. From the roof, you’ll be able to see business districts of Milan including 231 meters high UniCredit Tower – the tallest building in Italy. The famous Pinacoteca di Brera located in Milan consists of almost 40 halls with countless artworks by Hayez, Bellini, Titian, Raphael and Caravaggio. There are also a rich collection of Flemish paintings and works by Impressionists from the Middle Ages to the 19th century. Even a few hours you spend here won’t be enough to see all the treasures of Pinacoteca, but you should definitely devote some time observing two priceless masterpieces stored here – “The Marrige of the Virgin” by Raphael and the 3 meters high statue of Napoleon by Venetian sculptor Antonio Canova. Another famous artwork you can admire in Milan is the mural painting “The Last Supper” by Leonardo da Vinci located inside the Santa Maria delle Grazie. There are a lot of people wishing to see it, so make sure you have booked tickets at least one month in advance. Milan can also boast of the world’s most recognized opera house – La Scala. It has been a favorite meeting place of the Milanese aristocracy for thee centuries. All opera lovers dream to get a ticket to La Scala, but only those who are lucky enough to book tickets beforehand we’ll be able to embody their dream. A variety of seasonal discounts and an opportunity to buy really exclusive clothing attract thousands of fashion connoisseurs from around the world. Most Italian fashion houses have their branded boutiques in Milan. Like butterflies are attracted by flowers, shopaholics go to the light pouring from the shop windows. Milan is rightfully considered Mecca for all fans and admirers of high fashion, who are ready to spend a 2-3 thousand euro at once on renewing their wardrobes. 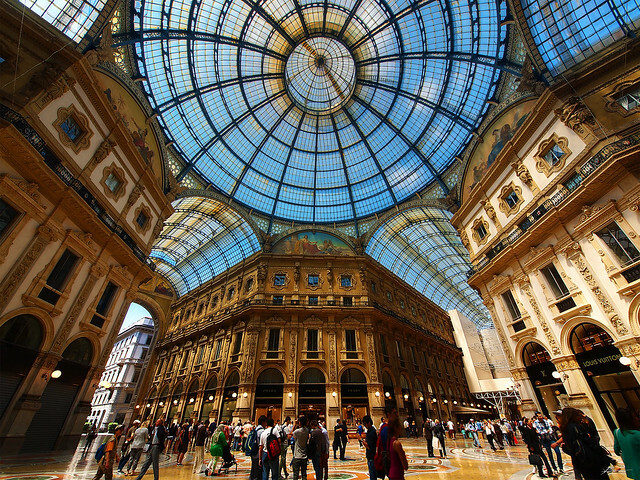 The most popular place for buying branded clothing and accessories is the Galleria Vittorio Emanuele II. The Gallery amazes not only with the huge number of luxury stores and restaurants, but also by its impressive sizes and architecture. This four-story construction has two spacious galleries with the massive vaults made of glass. Since it was built in 1877, the Gallery Vittorio Emanuele II has the right to be called one of the world’s oldest shopping malls. Whereas not all of us can afford to do shopping in the most touristic places in Milan, you have good chances to find high quality clothing for relatively low price in various outlets. But there is a nuance you should remember about. Usually, there is significant discount only on the items from old collections. Moreover, you should be lucky enough to find clothing of your size. If you are focusing mainly on purchasing different goods when visiting Milan, it’s recommend to buy a special shopping tour or to use service of a personal shopper. There are a huge number of different outlets, malls and boutiques in the city, so it would be very difficult for foreigner to orientate himself in all this abundance of various brands. No matter what Milan’s face is more attractive to you and what things you plan to do here, your own car rental vehicle will help you to get most of your vacation. Check out the largest choice of luxury and exotic rental cars in Milan.